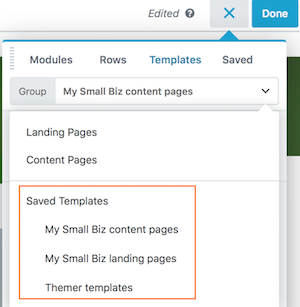 You can add categories and thumbnail images to the display of your custom saved templates in the Content pane. 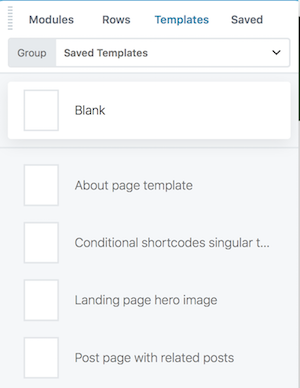 By default, if you save some layout templates and display the list on the Templates tab in the Content panel, you see a generic Saved templates choice in the Group list, as in the following screenshot. If you click Saved templates, you'll see a list of your saved templates in alphabetical order, with blank rectangles, as shown in the following screenshot. But if you assign categories to your saved templates, the categories appear in the Group list, as shown in this screenshot example. When you choose a specific category, the list of templates is displayed with the category displayed in the group column. If you add a featured image to your template, the list appears with thumbnail images, as in this screenshot. This extra effort makes it easier for you or your clients to find the right template for a new page. Tip: If you're using the Agency version, you can block the display of built-in Beaver Builder templates and display your own set of categorized templates. Here are the instructions for adding categories and featured images to your saved templates. Notes: You need more than one category for this feature to work. In the WordPress admin panel, click Beaver Builder > Categories (as of Version 2.1) or Builder > Categories (prior to Version 2.1). If you don't see Beaver Builder or Builder in the admin panel, see the Related Article on enabling it. Add a new category name, slug, and optional description, and click Add New Category. Repeat for each category you add. You can assign categories without adding featured images and vice versa, but they are both done in the same editing screen. Beaver Builder uses the template's featured image to create the thumbnail image. Repeat these steps for each template. 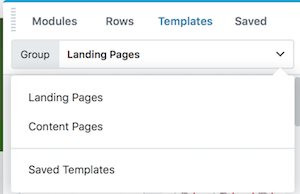 In the WordPress admin panel, click Beaver Builder > Templates (as of Version 2.1) or Builder > Templates (prior to Version 2.1). If you're editing a page in Beaver Builder, you can access the Tools menu by clicking the title bar in the upper left corner, then clicking WordPress Admin, then click Manage templates. In the Categories pane on the right, assign one or more categories to the template. If you can't see the Categories pane, click Screen options in the upper right corner and select the Categories checkbox. In the Featured image pane on the right, assign a featured image to the template. Click Update to save the template. Open a page for editing in Beaver Builder. 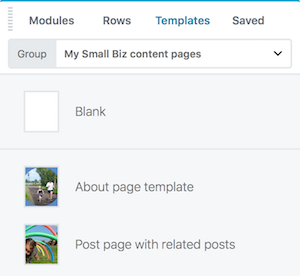 In the Content panel, click Templates and expand the group selection to view the custom layout templates list with categories.